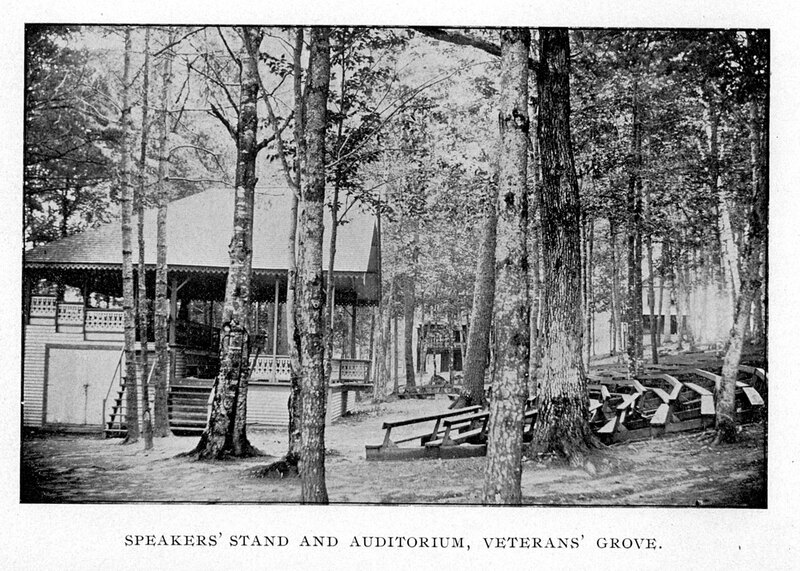 The Speakers Stand faced uphill and was located directly behind the 7th Regiment building. In the first B&W photo, visible off in the distance is part of the National Veterans Association building on the left, and the 15th Regiment building on the right. There were four civil war generals who gave speeches at the Speakers Stand: Sherman, Sheridan, Butler, and McClellan. And two Presidents: Theodore Roosevelt on August 28, 1902; and Ulysses S. Grant (also a Civil War general) on August 26, 1908. General John C. Fremont, who attended the August 1887 reunion, may have also spoken at the stand. 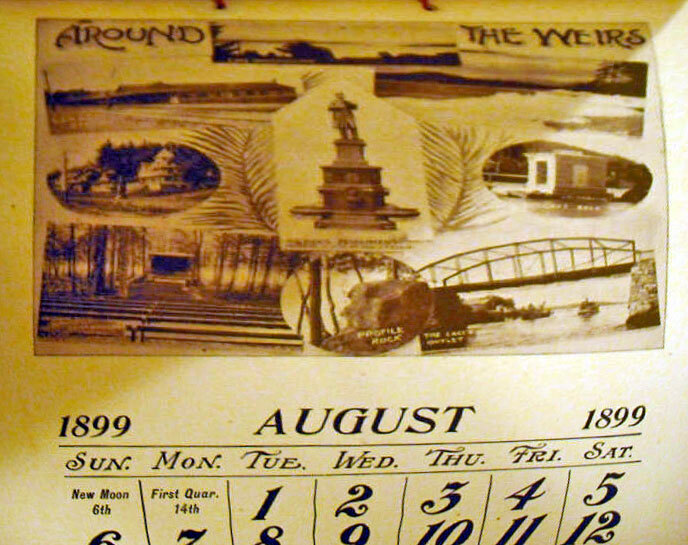 In 1924, the Speaker’s Stand burned to the ground in the Great Weirs Beach Fire. 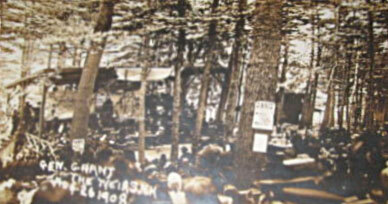 Click here to see a picture of the ruins of the Speakers Stand. The stand was rebuilt, only to be destroyed again by the 1938 hurricane. There were two versions of the Speakers Stand. 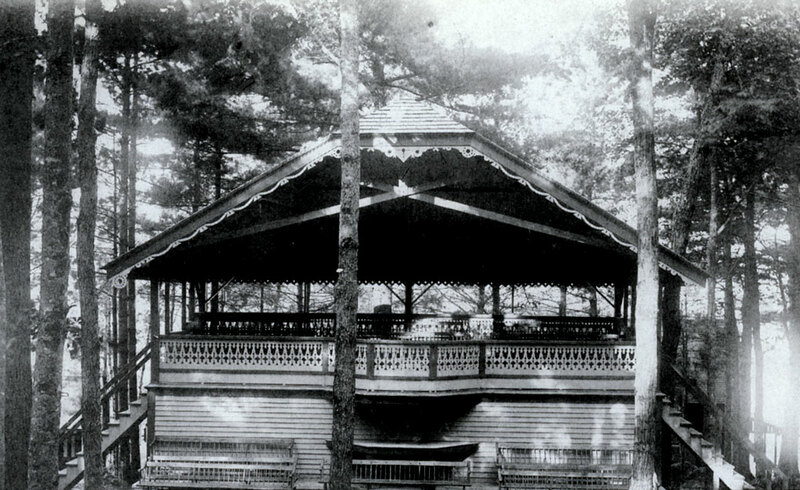 There was the first stand, an elaborate version with a gabled roof, seen above, in photographs from an 1897 souvenir photo book, which burned down in 1924. And then there was the rebuilt, simpler structure with a lean-to roof, seen below in the colorized postcard, which lasted roughly 14 years until it too was destroyed, in the 1938 hurricane. 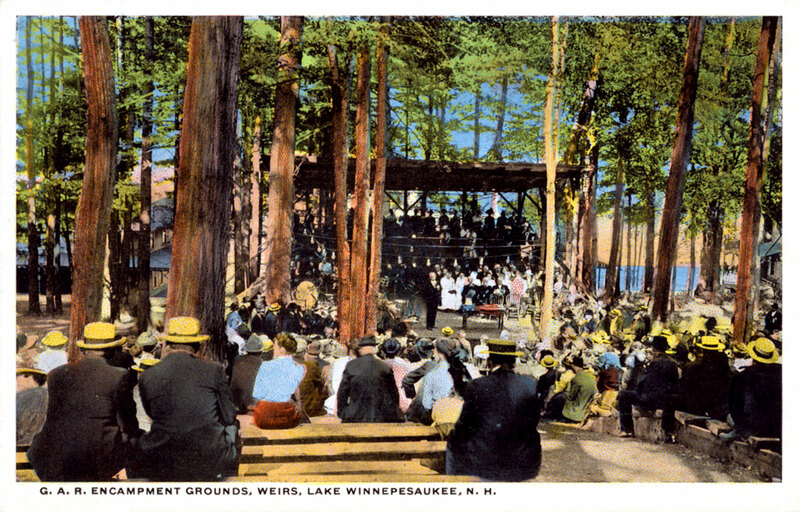 In the colorized photo, one can can see that Lake Winnipesaukee was partly visible through the trees behind and to the right of the Speaker’s Stand. 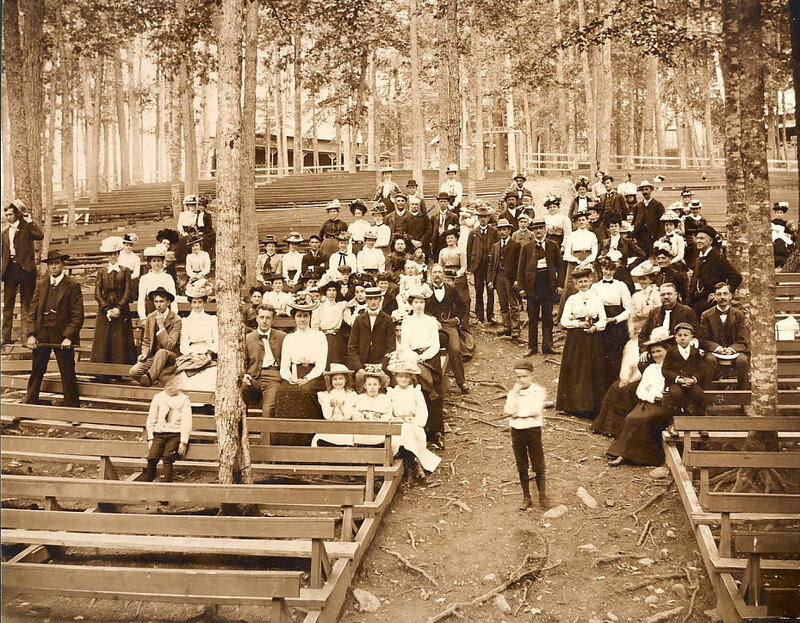 In this photo, of what is likely a wedding party, taken June 19, 1901 by the photographer C.D. Andrews, of Lakeport, it does seem possible that 3000 could be seated. The building in the upper left is the Heavy Artillery and Sharpshooters building. 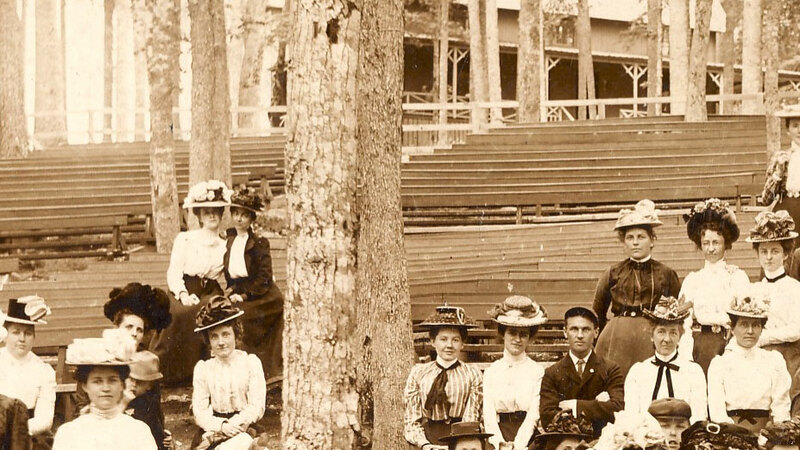 An interesting detail from the above photo shows the ladies in their fine garments, wearing their fanciest hats. Detail from a stereoview of the Speakers Stand by photographer F.J. Moulton. 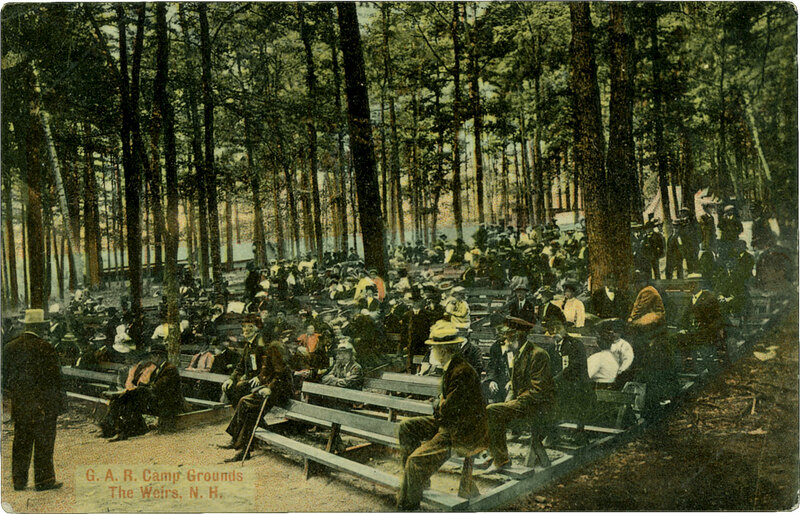 The Veterans Grove Speakers Stand was not the only auditorium in Weirs Beach. There was another, located at the Methodist Campground. 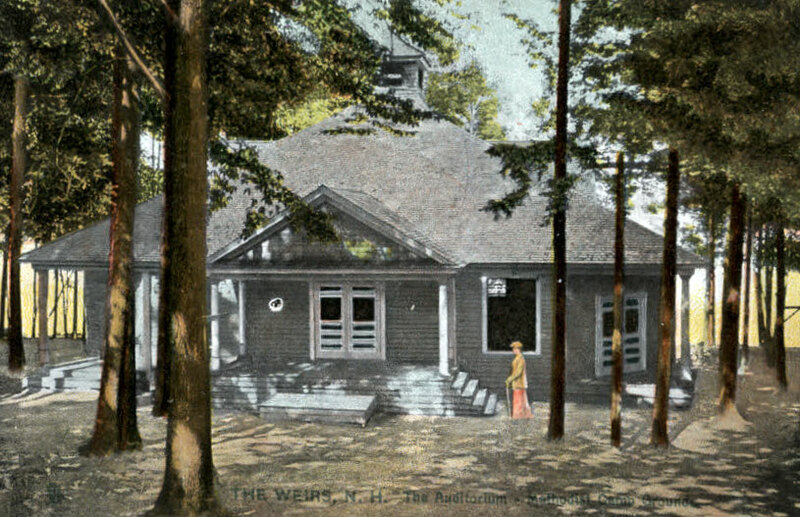 There was also another outside auditorium in Alton that was sometimes confused with the one in Weirs Beach. 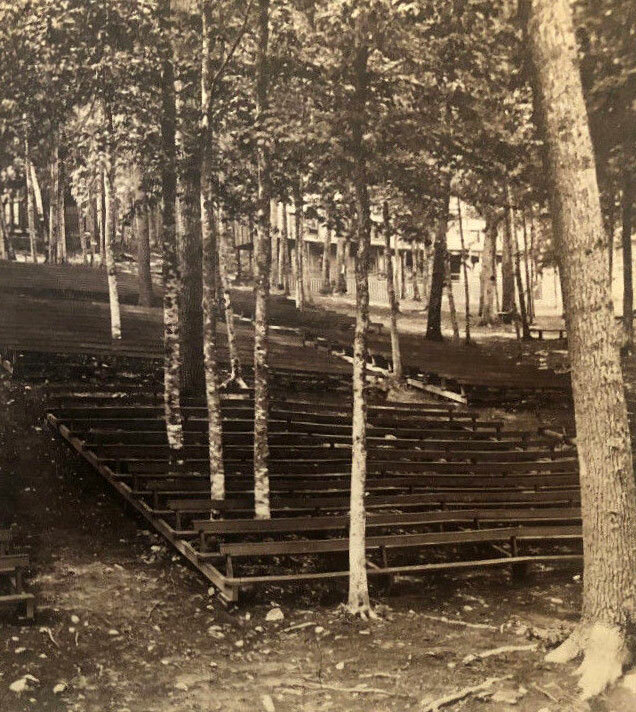 In Alton, at the Advent Christian Campground, also known as the Alton Bay Camp Meeting Grounds, the amphitheatre in Advent Grove served as the center of Sunday church services for thousands. 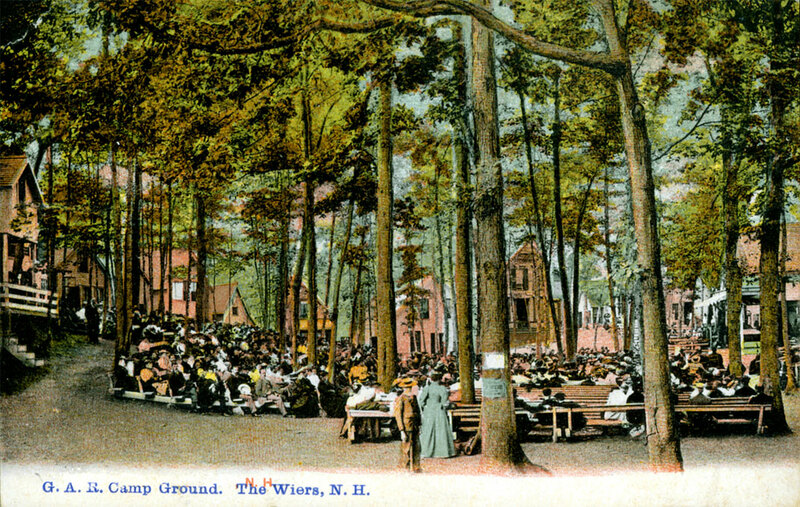 Apparently, the publisher of the postcard below confused the two amphitheatres, and mistakenly labelled it as being located in Weirs Beach.